Several times, Mondrian was forced to interrupt his education. He spent the entirety of 1897 with his brothers in the countryside. Falling ill with pneumonia in the autumn of 1898, he had to spend most of the following year in his parents' home. 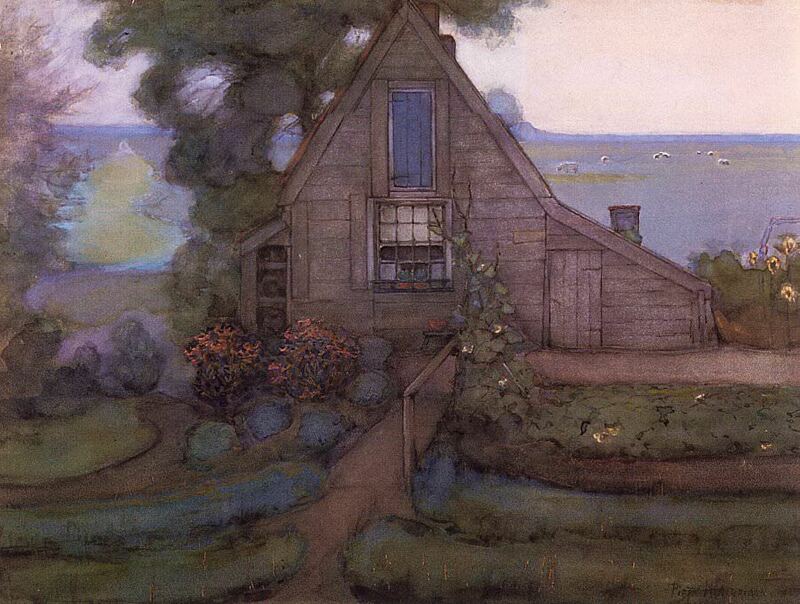 During these years, Mondrian painted prolifically, producing illustrations, most of them religious, some portraits and a large amount of watercolor landscapes, depicting rural scenes. Triangulated Farmhouse Facade with Polder in Blue is an example of his works of the period. Although little innovation is immediately apparent in these works, Mondrian had already come to understand that the future of painting did not lie in realism. Many of the works - even the landscapes - were painted in his studio, not en plein air, and sought to capture mood rather than detail. There is a certain resemblance to the paintings of the Post-Impressionists, like Paul Cezanne and Van Gogh, and the early Art Nouveau artists, like Gustav Klimt. It almost appears that, on observing the landscape, Mondrian tended on the one hand to extrapolate the natural element, which he began to identify with a primarily horizontal space (see the group of landscapes shown above) and on the other to accentuate in the opposite direction, i.e. the vertical, the shape of the non-natural spaces, the artificial, man-made spaces (windmills, lighthouses, churches).